A Sustainable Los Angeles? That’s the Plan! The City of Los Angeles' new (and first) Sustainability Officer thinks we should know something about the first half of his title. "Sustainability is not a euphemism for the environment," said Matt Petersen. "The true definition of sustainability is that it's about the environment, economy and equity and how we improve all three." If the notion of a "triple bottom line" sounds familiar, it should. The California Economic Summit has embraced the idea the last four years as it promotes ways to increase middle-class job growth in the various economic regions of California. The Sustainability Plan—or as it's branded The Sustainable City pLAn--is the brainchild of Mayor Eric Garcetti who has been promoting the idea since he sat on the L.A. City Council. While it's one thing to have a plan, it's quite another to measure success. The Plan plans to track its success in a very public way, so that people who are interested can follow the progress. "We are the biggest city to have a metrics dashboard related to sustainability," said Petersen. Some of the metrics will be updated frequently and some on an annual basis—based on when the data are gathered. For instance, the dashboard page reported that some 440,000 acre-feet of imported water have been purchased (environment), 21,000 new housing units are built (economy) and 40 non-attainment days of air quality have occurred (equity). Petersen said that he believes the plan will achieve between 75 to 100 percent of its 2017 Goals. While the Plan was Mayor Garcetti's idea, Petersen said it wouldn't have come to reality had not there been broad support among business, civic, non-profit and government leadership. "We spent a lot of time getting input from stakeholders, the Chamber, businesses, cleantech and universities and state and community groups." Not surprisingly, given the impact of California's mega-drought and Southern California's dependence of water from other areas---the issue of water is a big one for Los Angeles. "L.A. cannot continue doing this the same way. The drought actually is helping make the case," Peterson said. "We have declining snowpack due to climate change and a growing population." Mayor Garcetti's goal is to reduce L.A. water consumption by 20 percent by 2017 and have 50 percent of the water the region needs locally. There are 87 other cities in Los Angeles County--and many of them are also working on water conservation and preservation. The mayors of those cities meet quarterly, and twice in the last year-and-a-half the meetings have focused on how the cities and their various departments can work together. Issues like capturing storm water (when we have storms) and treating recycled water are among their discussion topics. Petersen said some L.A. County cities like Santa Monica, Pasadena and West Hollywood have long had sustainability programs underway, while others do not yet. The Plan has a "Lead by Example" chapter and conversations about cities working together have begun. Petersen said while the Plan is still very young, there's evidence that it's already working. Each city department has a sustainability officer. As an example, Petersen pointed out the L.A. Fire Department is changing how it tests equipment in order to save water. The other big idea here is that innovations created to meet environmental and equity goals are meant to support the economic ones. "The green economy matters—solar technologies, cleantech, investments in energy efficiency and water infrastructure—can all help create jobs in L.A.," Petersen said. Reducing the gap between the city's unemployment rate and L.A. County's (which is lower) is one of the jobs goals. One company is already booming thanks to the drought and subsidies available for homeowners to tear up their lawns, which would be replaced with native and drought resistant plants. The company is Turf Terminators--which has hired 550 people in the last year. They had three employees last year, said Petersen. "Homeowners are leading the charge," Petersen said. "They are tearing up their ornamental laws that only they and their gardeners ever walk on and now we have drought tolerant landscape popping up--It shows we can do that." Time will determine what progress Los Angeles is making. 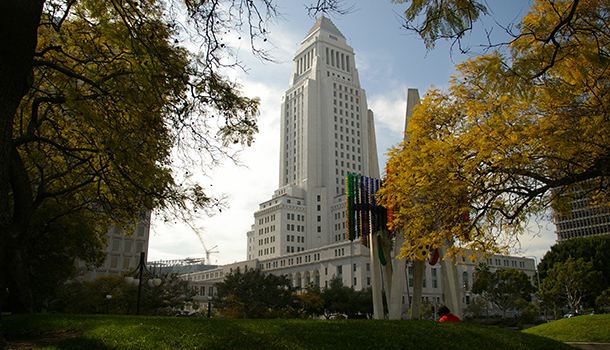 Next year L.A. will issue an annual report tracking results. Petersen is optimistic. "It's a cultural shift we are asking the people to make," he said. "We have the political will for the first time thanks to the leadership of Mayor Garcetti and Governor Brown. And our residents our paying attention and stepping up."